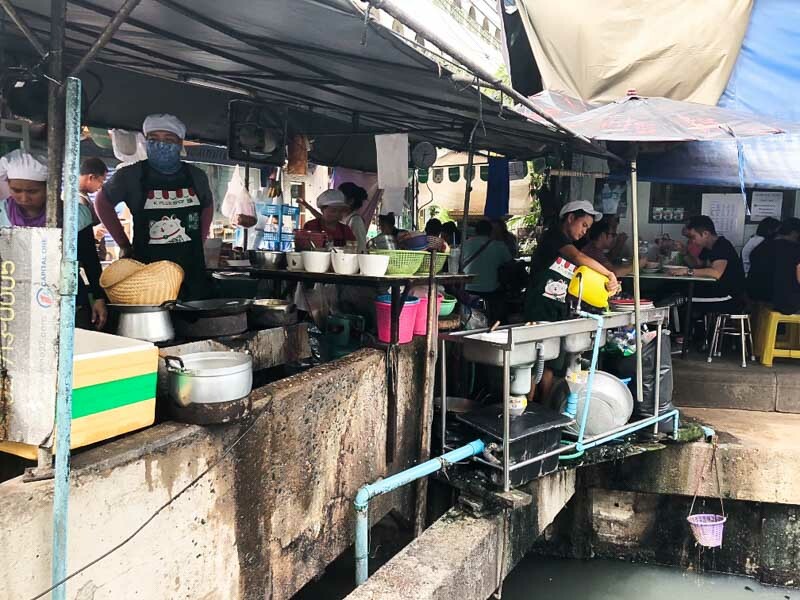 When it comes to food in Bangkok, it doesn’t get any better than street food. You just need to know where to go, and there’s one popular spot that never fails to deliver. 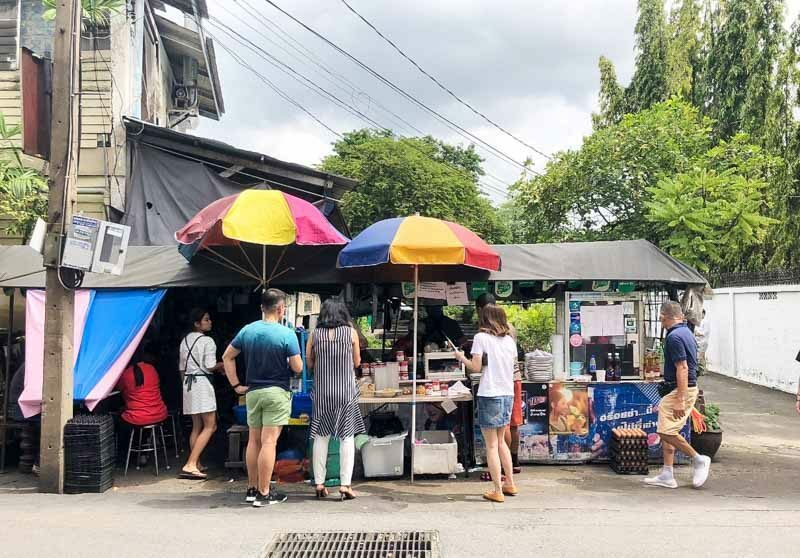 Nhong Rim Klong is no secret in the street food scene, located along the quiet lane of Ekkamai Soi 21. The make-shift street hawker is perched over a canal, and draws quite the crowd. We arrived after 2pm hoping to avoid the busy lunch hours, but there were still quite a few folks waiting in the sweltering heat. Lucky for us, we only had to wait for about half an hour but do expect more waiting after you are seated. Apart from takeaways, there were a lot of delivery orders being sorted and locals who popped by in cars and on bikes to pick up their food. To avoid long waiting times, especially during peak hours, you can also call and order your food in advance. As a rule, it is safer to call and check if they are open before making your way down. There is an English menu so it’s very easy to order, and you’ll want to keep this handy if you’re planning on calling to order in advance. The stall is famous for its seafood dishes, especially the ones which include crab. 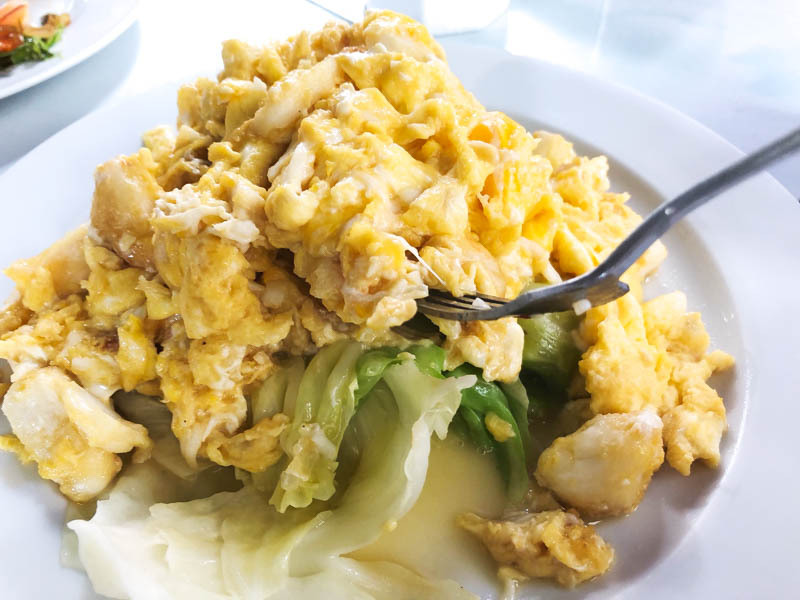 We started with the Stir Fried Egg With Cabbage and Fish Sauce (THB 340), which comes with the option of crabmeat chunks but you can request for cabbage only if you are having other crab dishes. Sauteed with garlic bits and fish sauce, the cabbage slices in the broth were light and crunchy. The crab chunks were lightly browned and this helped to retain the juiciness of the meat. Combined in a runny scrambled egg mixture that brought out the flavour of each ingredient, this was a delightful start to our meal. 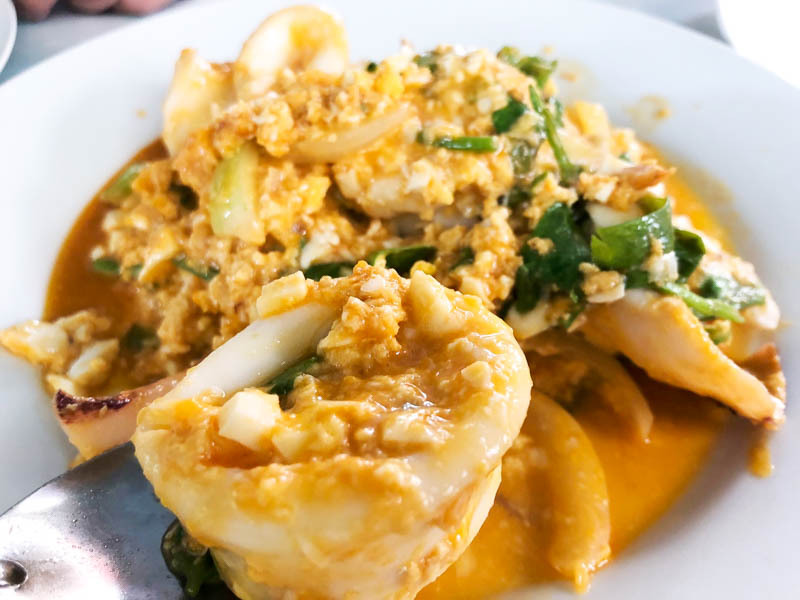 The Crab Omelet (THB 440) is an absolute must-have when you are here. 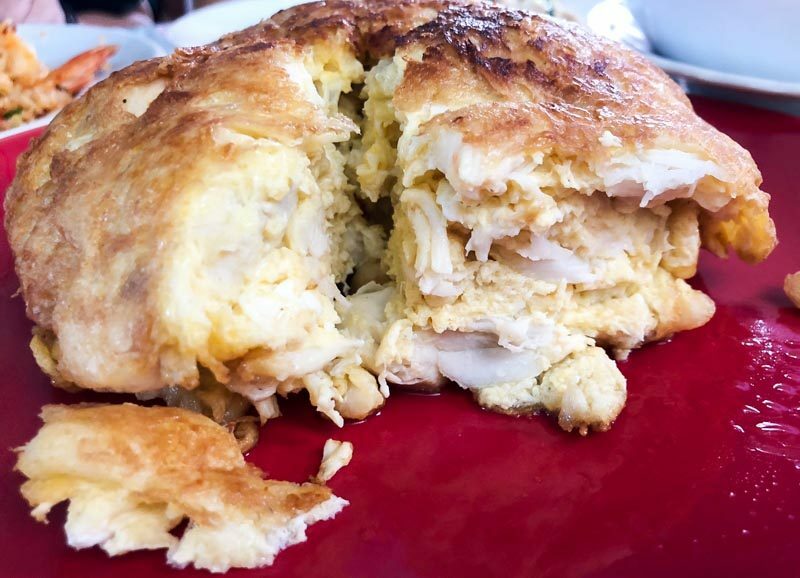 Generous chunks of crab meat were hidden in this thick, fluffy omelette that was fried to a nice golden-brown on the outside, and yet was still moist and spongy when we dug in. The Squid with Salted Egg and Vegetables (THB 200) looked a little like a stew. The gravy had a good balance of seafood sweetness infused with Thai basil and spices. The squid was cooked just right, making it easy to chew despite the large slices. I loved that the baby eggplants and long beans were a little undercooked, giving the dish a nice contrast in terms of texture and taste. You’ll enjoy this even more with a bowl of steaming hot Thai jasmine rice so remember to order one! The Spicy Seafood Soup (Tom Yum) (THB 200) was another top favourite. 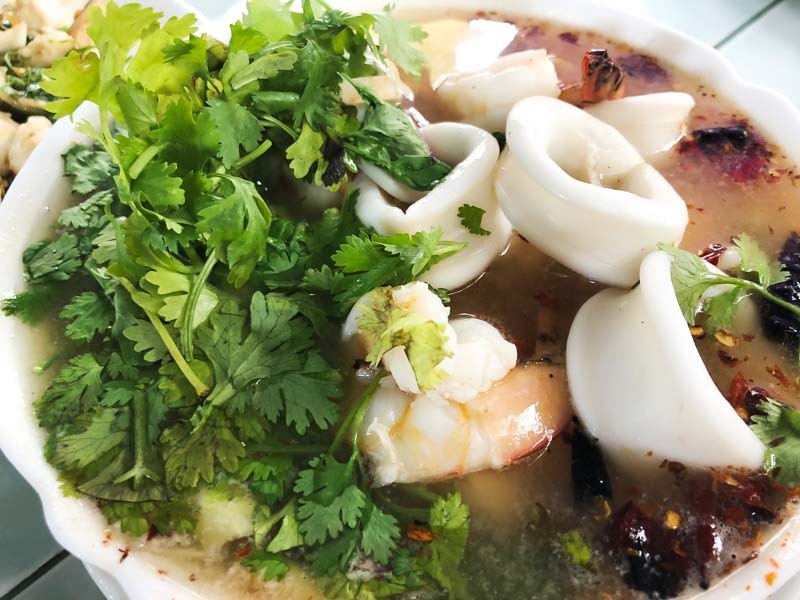 This clear herbal version was a powerhouse of lemongrass, galangal and chilli swimming in a fresh seafood-filled broth. Served with a generous topping of cilantro, it was spicy and sour at the same time. The only slight pity was that it lacked a certain sweetness that made this version rather one-dimensional due to the spice level that dulled the other flavours instead of accentuating them. I will try the milky version on my next trip as my guess is that the evaporated milk is what will add to the creaminess and sweetness of this dish. 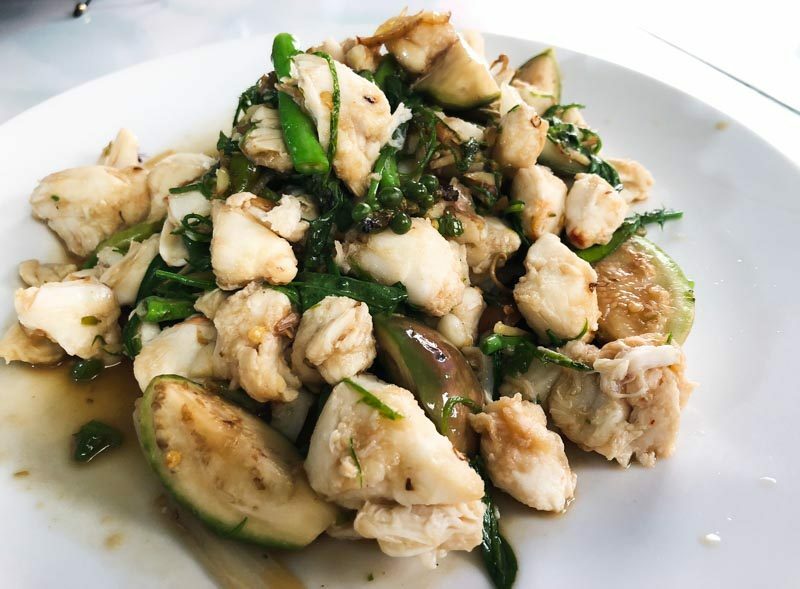 The Stir Fried Spicy Chilli Sauce with Crab and Vegetables (THB 440) is a seafood rendition of the popular Pad Kraprow Gai (Thai basil chicken), and you’re going to want to have this with rice as well. The use of crabmeat was very generous in this dish, and every single piece was chunky. Substantially coated in hot oil infused with garlic, green peppercorns, chilli and basil, each bite was an aromatic punch, so spicy and flavourful. 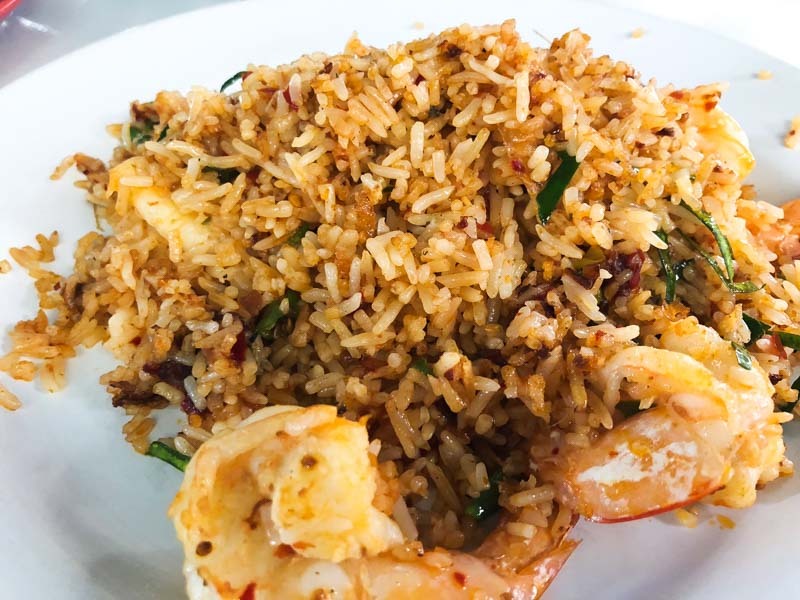 If a solid dish of carbs is what you’re after, don’t leave without trying the Adapted from Tom Yum Soup to Fried Rice With Shrimp (THB 120). Nhong Rim Khlong managed to whip up this dish with sufficient wok hei, and a good level of tom yum flavour. The rice was moist but not overly wet, and there was a good serving of fresh squid rings and prawns. All the portions from Nhong Rim Klong were generous and hearty, which pretty much explains the price and the hype. 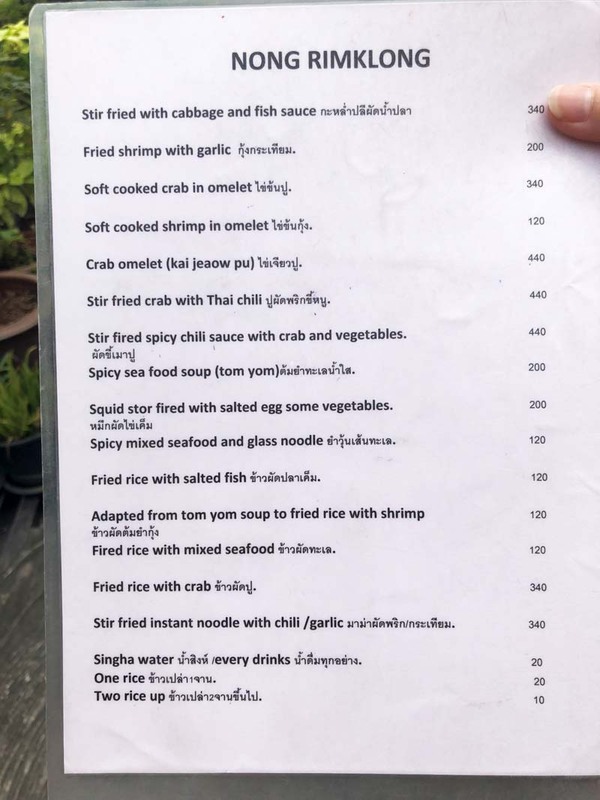 The seafood was fresh and tender, and the crab dishes were certainly winners. As with all roadside stalls, be prepared to brave the heat and mozzies, but it’ll be so worth it!